Old motorcycle engines can be hard to start. You’ll find some old bikes have a very specific cold starting procedure. This page will go over some of the more common starting techniques if your engine is cold or if you’ve just rebuilt the motorcycle. After that, you’re ready to break it in. For the gasoline to ignite in the engine’s combustion chamber it needs to vaporize. It’s much harder for gas to vaporize when the engine is cold, which is why cold engine require a much richer fuel mixture than they require at normal operating temperatures. 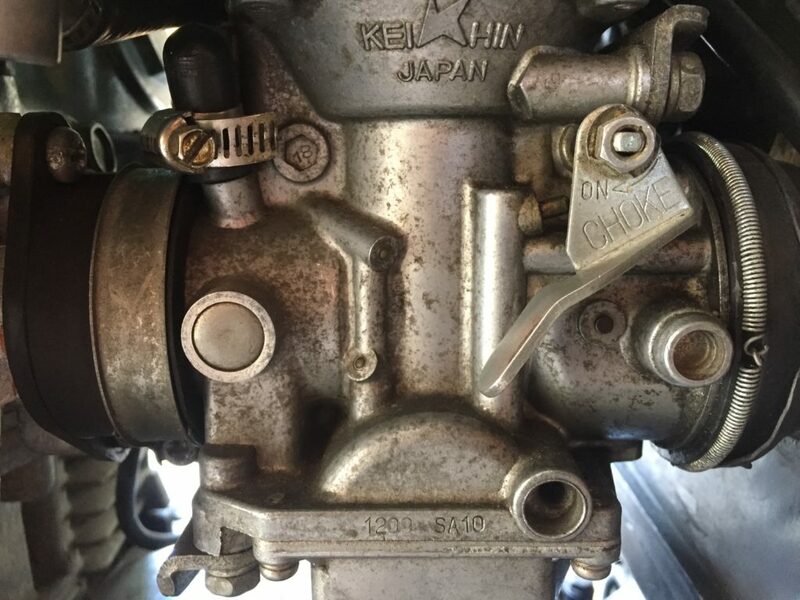 To start, check out some of the common engine starting procedures based on the type of carburetors your motorcycles have. Turn on the fuel tap. Pull out the enriching lever/plunger. Leave the throttle closed and start the engine. Put the choke lever on. Open the throttle slightly as you start the engine. Hold the plunger down until the carbs a filled with fuel. If your motorcycle engine won’t start because you’ve flooded the engine with gas, you can try to clear it by open the throttle fully as you crank the engine over. This will draw air into the engine to clear out the gas. If it’s severely flooded, you can take out your spark plugs to try to clear it. If your motorcycle doesn’t have a kick starter and the electric starter fails or the battery is low, you may need to push start it. Put the motorcycle in second gear. Pull the bike backwards with the clutch engaged until the rear wheel stops. The engine should be at Top Dead Center (TDC) at this point. Turn the ignition on and set the choke. Pull in the clutch lever and start pushing the bike as fast as you can. Being on a slight downward slope will help. When you can’t go any faster, jump onto the bike and release the clutch when you’re fully on the bike. If the engine start, pull in the clutch and keep the engine running. Remove the choke and you’re good to go. Repeat the procedure if this doesn’t work.